The proposed kite trips are accessible to all autonomous riders (see "Requirements" for more information). The level of each of these kite trips downwinders is mentionned in the Synthetical table of all downwinders below. A Detailed description of each itinerary is to be read at the end of this page. Photo shootings can be organized during the downwinders especially for the Ile aux Cerfs itinerary, and the Palmar – Poste Lafayette itinerary. Ask us. This beautiful downwinder starts with a speedboat ride from Trou D’Eau Douce to the outstanding Ile aux Cerfs through the tropical mangrove. Once on the island, it’s time to launch the kites and discover this beautiful place. The lagoon is huuuuuge and cristal clear. So it’s also a good opportunity for amazing photo shootings. You start from a narrow beach of white coral sand and then you can ride kilometers of lagoon around the beautiful Ile aux Cerfs. As this place is far from the coast, you can be sure you won’t be disturbed by the crowd. 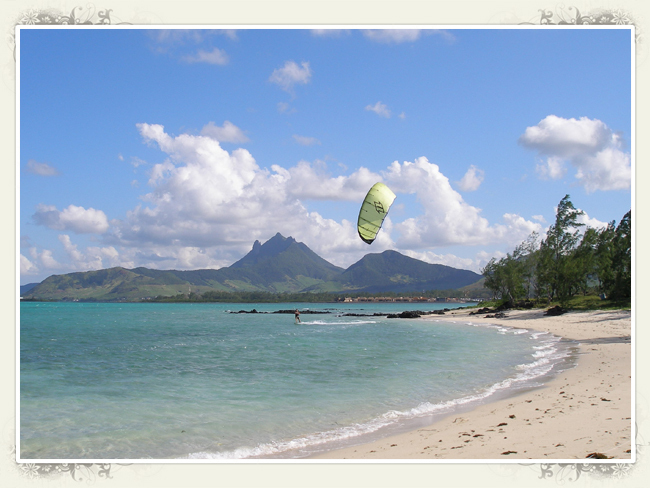 It makes this kite trip one of most wonderful of Mauritius. You can ride even more upwind to a flat water area sheltered by the Ilot des Roches and the reef and called “Joy ride”! The name tells the program…! Freestyle paradise! You have plenty of time, so just enjoy! At the end of the trip, you will ride downwind from there on 8km of blue water around the coast of the Ile aux Cerfs. You will then ride through the big and beautiful bay of Trou d’Eau Douce, which is the lovely fishermen town where you end. This downwinder starts from the spot of Palmar beach where the kite lessons of Kitesurf Paradise Kiteschool are held. It’s a beautiful and easy spot, very flat where you can warm up before the downwinder starts. Once the start is given, you will ride downwinder between the reef and the coast all the way long. You never need to go outside the lagoon. You first go along the beautiful beach of Belle Mare and you can make the show in front of the hotels on the coast. The water is shallow and flat except when you ride across the pass of Belle Mare. The lagoon is narrow until you come close to the second pass called PPass of Flacq, which is very deep, then the lagoon broadens to kilometers. On the coast you can see the Hindu Temple of the “Mare aux Lubines”. Then you have a small island called Ile Malino just before the beautiful bay of Bras d’Eau fringed by the mangrove. If you choose to go downwinder to better admire the bay and enjoy this flat water spot, you will then have to go slightly upwind to reach Poste Lafayette beach which is the end of the itinerary. There you can enjoy this outstanding spot of Poste Lafayette riding the infinity of colors between blue and green of this flat lagoon. Photo shootings are also possible there. If you prefer waves you can even go riding some on the shallow reef! It’s good to mention that this beach can be reached by car, your friends who don’t participate to the downwinder can therefore meet you on this beach to share with you the end of the day in this paradisiacal place. This downwinder starts with a big speedboat ride from Trou D’Eau Douce to Pointe d’Esny where this day kite trip starts. The landscape in Pointe d’Esny is really breathtaking: you can see the mount called Montagne du Lion in front of a big bay where the lagoon has all shades of blue. Indeed you have more than 30 kilometers of downwinder inside the lagoon to ride until Trou d’Eau Douce. On your way you will come close of several beautiful islands. The first island you meet is the Ile aux Aigrettes. You will have to ride upwind to this island to start the downwinder. Then you will follow the reef and ride through a big pass where you will have to deal with waves. Don’t worry we will be by your side to tell you where to go. Once you have crossed it, you will reach the Ile de la Passe, the Ile Vacoas and the Ile aux Fouquets, with its phare. 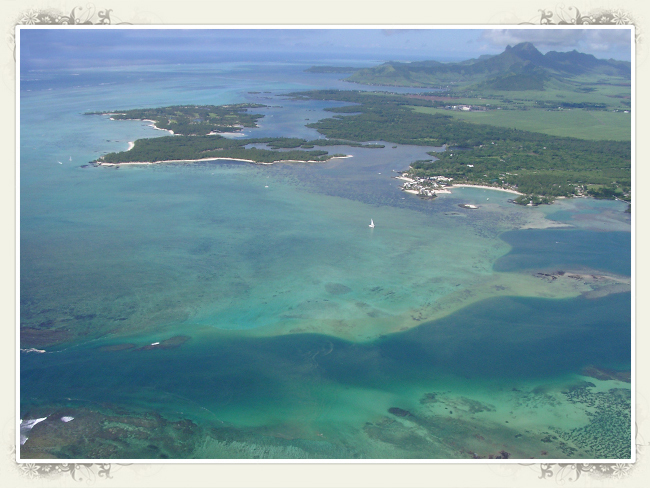 Then you can admire the Ile aux Fous and the Ile Marianne. On the coast side you can admire the green mounts of the Montagne Bambous. Then you have a big ride until the cape of La Pointe au Diable. This cape is at half way of this kite trip, but from there you can really ride completely downwind. You will then go through another large pass before reaching the sand bank called Ilot Flamants that you can walk through. You will then go through the last but not least pass: you will have to go down big waves before returning to a very flat water sheltered by the reef called “Joy Ride” just under the Ilot des Roches. From there you ride downwind to the famous and beautiful Ile aux Cerfs where you will have a -late- lunch. You just land your kite on the white coral beach and sit down under the filaos trees to have a break. You can admire the landscape while eating. You can then enjoy some riding and freestyling in the wonderful crystal clear water of the Ile aux Cerfs before the final ride to Trou d’Eau Douce which is the lovely fishermen town where you end. Finally at the end of the afternoon you ride downwind on 8km of blue water around the coast of the Ile aux Cerfs and then through the beautiful bay of Trou d’Eau Douce, the lovely fisherman town where this downwinder ends.